Eurasian plate and its associated micro plates span the globe from 8 degrees south to nearly the North Pole and from 35 degrees west to nearly 150 degrees east. 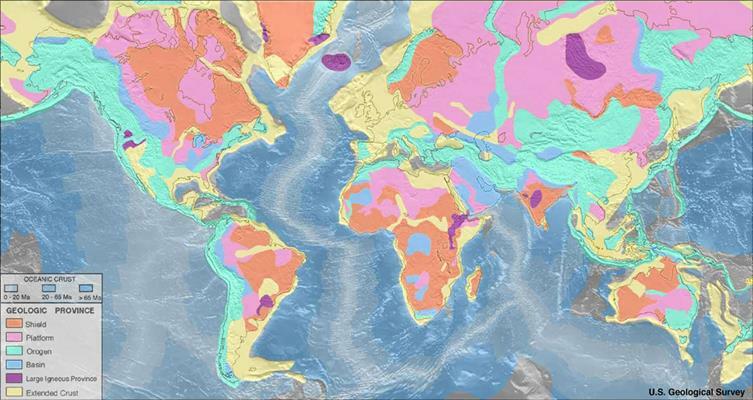 Because this plate is so large and has many different kinds of boundaries with different plates we observe a large number of different geologic features. On the above image we can observe that on the surface of the Eurasian plate can be described by six different geologic provinces; shields, platforms, orogens, sedimentary basins, igneous provinces and extended crust. There are important large igneous provinces on the Eurasian tectonic plate. They include the Deccan traps and Rajmahal traps in India, High Arctic large igneous provinces, the north Atlantic large igneous provinces and the Siberian traps. There are currently 17 orogenies documented on the Eurasian plate. The largest one; the Alpine-Himalayan was caused by the closure of the Tethys sea as the Indian plate drifted towards the Eurasian plate. Paquette, J. -L, and J. -L Le Pennec. "3.8 Ga Zircons Sampled by Neogene Ignimbrite Eruptions in Central Anatolia." Geology 40.3 (2012): 239-42. SCOPUS. Web. 30 Jan. 2014. Korsakova, M., et al. Metallogenic Areas in Russian Part of the Fennoscandian Shield. Vol. 2012., 2012. SCOPUS. 30 Jan. 2014 <www.scopus.com>. Author: J. Zavacky. The Urals. Author: K. Giovanni. Alps tectonics.